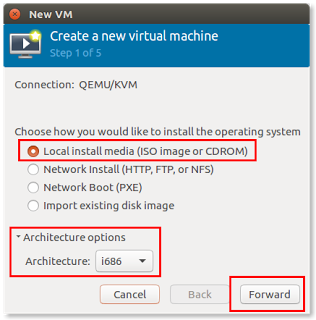 This article is a continuation of our previous tutorial about installing QEMU/KVM and virt-manager in Ubuntu. First step, press A New Virtual Machine button. This invokes a new window. Select Choose how: Local install media then select Architecture: i686. Press Forward button. (4) press Choose Volume button. Remember that it is better if the ISO file is in the same partition as your $HOME directory. Third step, adding virtual memory and CPU amounts. We choose 700 MB RAM and 1 cpu. This depends on your own hardware capability. It is better to give the guest OS appropriate RAM but leave the host OS handles the most. It is better to don’t give guest OS more than half of your total RAM. You may choose more or less. Press Forward button. Fourth step, create new or select already prepared virtual storage (virtual hard disk). If this is your first time to use KVM, press Manage button then follow the next picture. (5) select the generic.qcow file just created and press Choose Volume button. Fifth step, you give the name for your virtual machine. For example, we name it Xenial because it runs Ubuntu Xenial Xerus. Select NAT for the Network selection option. 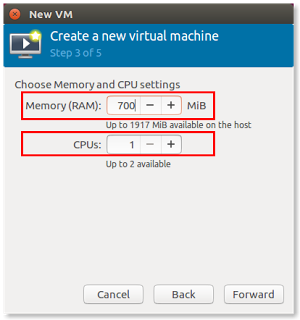 While pressing Finish button, a small dialog appears indicating a progress of creating virtual machine. 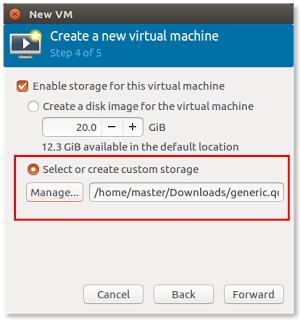 After the fifth step, you should find Virtual Machine Manager with QEMU/KVM runs your Ubuntu as virtual OS. See the title bar “Xenial on QEMU/KVM” indicating it is a virtual machine named Xenial running in QEMU/KVM virtualization solution. You find this as Ubuntu OS running another Ubuntu OS. Xenial running Xenial. 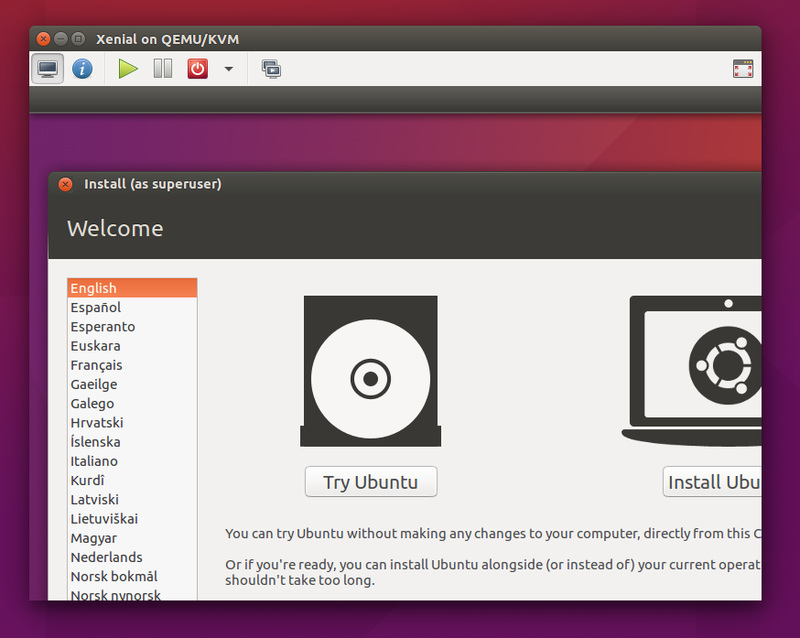 In this picture, it shows the first step of Ubuntu installation.